Our Tomato & Peach Tea Sandwich is delectably delicious. Serve as a quick snack. Or, prepare a big batch for easy entertaining. Use rolling pin to flatten bread slice to 1/4-inch thickness. Cut crusts off bread slice; discard crusts. Spread bread with cream cheese product; cut in half. 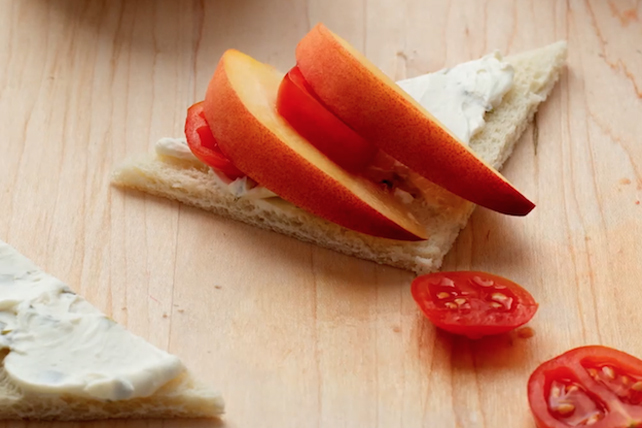 Fill bread halves with tomatoes and peaches to make sandwich.